Woody, along with Cher, Madonna and Prince, has always been known by just one name. But it turns out the sheriff has a surname, much to the bemusement of Toy Story fans. Although not revealed in any of the three movies to date, director Lee Unkrich revealed the second name of the cowboy. 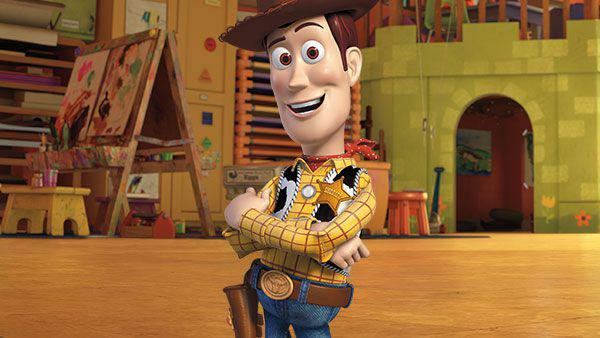 Woody’s actual full name is ‘Woody Pride’ and has been since the earliest days of developing the original Toy Story. With all due respect, you can see why it was dropped. Still, who knows, it might be uttered in Toy Story 4, projected to come out in June 2019. Can’t wait that long for your next TS-related hit? It’s just as well that Walt Disney World will open the magical Toy Story Land this year. Disney describe the park – situated on the California site – as a ‘colourful landscape’ filled with ‘giant building blocks and game board pieces’, and they want you to be immersed in an experience ‘straight out of Andy’s vivid imagination’. The park’s buildings have been designed to look like ordinary objects, making guests can feel as though they’ve been shrunk to toy size as they venture through the park. You’ll get to hang out with the likes of Woody, Buzz, Slinky Dog, Rex, the Aliens and many other beloved Toy Story characters. 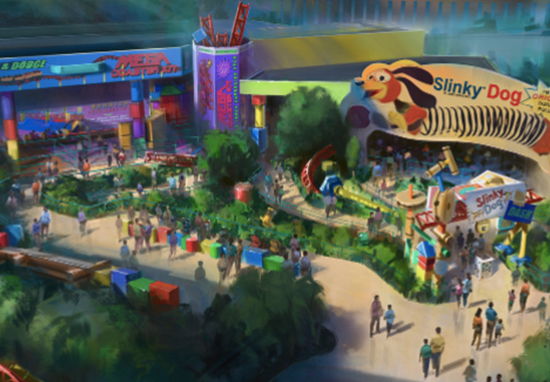 The main attraction will be the Slinky Dog Dash rollercoaster, where you’ll sit in a Slinky Dog carriage as it bends and twists the slinky coils around curves, hills, bridges and drops. Another ride, the Alien Swirling Saucers, will take you on a dizzying ride through space! Hang on tight as your toy rocket ride takes off, all while space electronica provides an out-of-this-world beat. There’ll also be an arcade area with a rocket-themed ride called The Claw, aimed at Buzz Lightyear fans. Earlier this year Disney published details of ‘Woody’s Lunch Box’, an amazing food court where guests will be able to dine out on soda floats and delicious snacks and treats. We can’t wait for our guests to experience Toy Story Land, and the new quick-service window located within the land will surely delight hungry toys and people alike. We are thrilled to collaborate with Mini Babybel and introduce additional snack offerings in Toy Story Land and throughout Walt Disney World Resort and Disneyland Resort. Ever since Bob Chapek, Walt Disney Parks & Resorts Chairman, confirmed Toy Story Land was in the works at the D23 Expo 2017, fans have been eagerly waiting for the opening date – expected to be during next summer.